Craving Blueberry Cheesecake but don’t have the time (or patience) to bake an entire cheesecake? 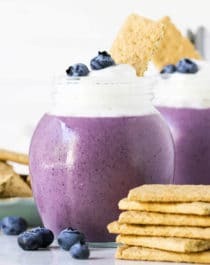 Make this 5-minute Blueberry Cheesecake Dip! It’s super thick, creamy, sweet, and refreshing, just like cheesecake batter, but made without the white sugar, eggs, and heavy butter and cream cheese. One spoonful and you’ll be shocked to know it’s refined sugar free, low fat, high protein, and gluten free too. This Blueberry Cheesecake Dip is so easy to make, you’ll be digging in in no time at all! Craving Blueberry Cheesecake but don't have the time (or patience) to bake an entire cheesecake? Make this 5-minute Blueberry Cheesecake Dip! It's super thick, creamy, sweet, and refreshing, just like cheesecake batter, but made without the white sugar, eggs, and heavy butter and cream cheese. One spoonful and you'll be shocked to know it's refined sugar free, low fat, high protein, and gluten free too. Plus, it’s got 9g of protein and no added sugar. This filling cheesecake batter-like dip will satisfy your sweet tooth without the excess calories, fat, and sugar, typical to its baked cheesecake counterpart. So go ahead, have an extra serving (or two)!